Arrow ups the tension as Cayden James threatens to reduce the city to rubble with the bomb he has been holding onto for some time. This season has spent a lot of time focusing on parental relationships. Oliver learning how to be a father to William has been a running narrative, Slade had some lingering issues around his own son earlier in the season, Quentin has been struggling to deal with an alternate universe duplicate of Laurel and Cayden James is motivated by avenging the death of his son. Even Felicity has had the opportunity to learn what being a stepmother is like. Cayden James escalates the conflict this week when he threatens to detonate his bomb and reduce the city to rubble. The only option left for Team Arrow is to prove that Oliver didn’t kill his son. It’s a long shot and the episode directly addresses it but it’s also the only chance they have. Thanks to the combined hacking talents of Alena and Felicity the video is revealed to be a fake and Oliver is able to take the information to James who relaxed his ultimatum a little. After this the episode shifts gears into a manhunt for James’ associates because he suspects that one of them must be responsible. It may be yet another plot to blow up Star City but there’s no denying it gives the episode and the season a much needed sense of urgency. The looming threat makes it feel like every second counts and keeps the stakes in mind throughout. It doesn’t feel especially difficult to round up James’ cabal of villains but time is the real enemy here and the true aim is to leave enough of it for the emotionally charged climax. As villains go Cayden James is one of the stronger ones Arrow has had. He’s problematic in the sense that the scale of his plans don’t seem to match his stated motivations but he’s cold, calculating and the type of threat Team Arrow can’t easily defeat. They can’t really fight computer hacking which means they are more reactive to what he does therefore giving him an advantage. The show did a good job early on of establishing him as far more skilled than Felicity, Curtis and Alena so all they can do is react to his actions as well. 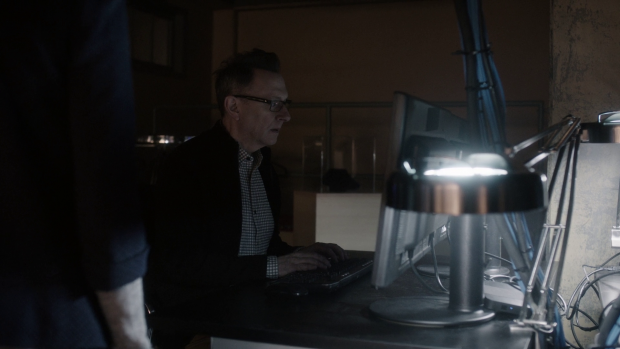 It almost goes without saying that Michael Emerson is a really engaging character actor and there’s no denying that if it wasn’t for his performance Cayden James wouldn’t be nearly as engaging. One thing that the writers have so far failed to do is add depth to Cayden James. He’s a unique challenge for Team Arrow with an excellent performer bringing him to life but there was very little beyond what we see on the surface. This episode goes about fixing that by making him the subject of flashbacks. He has mentioned his son on several occasions but we previously had no sense of that relationship so these flashbacks help fill in the gaps. It turns out that his relationship with his son Owen (Jesse Irving) was strained because James was so wrapped up in his work at Helix that he neglected him. This neglect wasn’t intentional as the first flashback shows him trying to fulfil his responsibilities at Helix and as a father but failing. He arrives as his son’s game too late to see it and tries to cover it up by telling him how good it was. It’s something Owen easily sees through and this one scene allows us to project the kind of relationship they had. It helps add context to James’ motivation as there is a lot of regret in his life. He feels that Oliver robbed him of the opportunity to reconnect with his son therefore meaning that his son died being ashamed of him. The flashbacks also show us that Cayden James was adamant on changing the nature of this relationship. One of his hacks puts him in the cross hairs of A.R.G.U.S. but he’s still willing to risk being locked up for the rest of his life to prove that he’s the sort of father that he wants to be. As far as Owen is concerned his father would have simply disappeared therefore furthering the disappointment and that relationship is never repaired before he was murdered. It’s tragic and certainly adds a level of sympathy to Cayden James that makes his behaviour in this episode make sense. Another good thing about the flashbacks this week when compared to last week is that they develop the character of Cayden James while also giving the audience new information rather than blandly visualising events that we already know enough about. This is a great example of concept working in tandem with capable execution. It could be argued that Cayden James is fairly one note in terms of how he is written and that’s definitely a fair assessment. 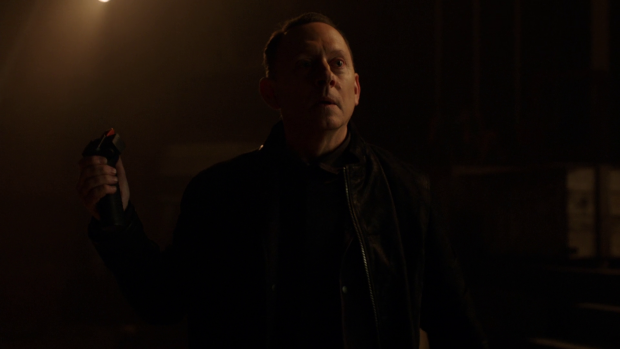 A lot of what makes the character interesting is brought out by Michael Emerson so it’s good that the flashbacks let us see a different side to him. In particular the scene where he finds out that his son has been murdered is really powerful. Emerson plays the shocked and pained reaction flawlessly and the simple declaration that his son was only 18 years old really sells how unfair it is. The A.R.G.U.S. Agent (Lee Shorten) actually helps this moment by seeming genuinely sympathetic indicating that there are real people working for them, something that is often lost in faceless secret government organisations. Ultimately this added depth is all in service of setting up a scenario where it’s possible for Cayden James to be redeemed. His redemption doesn’t involve a complete flip to working with Team Arrow but it’s certainly enough to make him conflicted about his actions and question who he can trust. We saw last week how he deals with traitors in his criminal organisation and this week has him potentially betrayed by everyone around him without knowing who it is though it’s questionable that he appears to be leaving them to die in the explosion. It’s something that isn’t directly addressed in the climactic exchange even though it definitely should have been but the idea that criminals can’t work together effectively because of a lack of trust is an interesting one if a little overplayed in other shows like this. The climactic scene between Team Arrow and Cayden James was excellent. James was clearly unravelling and at the point where he wasn’t sure if his crusade was worthwhile any more but still didn’t want to surrender to Oliver. The question of who actually killed his son still lingers and he comes across as being really unstable rather than the calm presence he has been before now. The reason for this is that he no longer knows the truth about his son’s death and his entire mental state was built on the foundation of knowing who his target was. Now that this knowledge is beyond him he completely loses his certainty and conviction.. It’s a great stand-off because James is incredibly unpredictable which makes him even more dangerous than before. Emerson’s performance flips expertly from seeming like someone who could be reasoned with to off the scale insanity. It’s the performance that sells the moment and it’s fitting that it takes place in an abandoned theatre because it plays out like a one man show. William’s presence here increases the tension because he’s an innocent who is now put in harm’s way and symbolises everything that Oliver is trying to protect. Becoming a father has been a defined arc for Oliver this season and William being involved clearly links to James’ motivation. He even addresses it himself and seeing how devoted Oliver is as a father distracts him long enough for Oliver to get the upper hand. This is where the real villain of the season is apparently revealed. Ricardo Diaz was the one to kill Cayden James’ son to send him down the path of making the city ready for being taken over. This scene is really well played with Kirk Acevedo delivering a first rate sinister performance. It’s a pity that Cayden James is killed because there’s a lot this character can bring but Ricardo Diaz is very much a blank slate with no real indication of how he will challenge Team Arrow or go about taking over the city. Diaz is a refreshing villain for this show because he has no personal connection to Oliver or any other member of Team Arrow so isn’t seeking any form of personal reconciliation from any of the characters. As far as we know he’s simply a crime boss with aspirations of taking charge of the city and have all the residents live in fear. He’s a lot like Brick in that regard with the important difference of working from the shadows. Up until this point he has existed in the background and only pretended to follow James’ lead in service of his own plan. What isn’t clear is why that is. Why did he orchestrate the death of Cayden James’ son then agree to help him build a bomb that might destroy the city? For this to work we have to forget the fact that he was on the run when James threatened to blow up the city when it was all supposed to be part of the plan. To the episode’s credit the reveal was so well done that the plot holes don’t really stand out as much but they could become a problem in future episodes. Another complication for the urgent situation faced by Team Arrow as the clock ticks away on James’ ultimatum is Dinah’s vendetta against Evil Laurel. She is so consumed by her desire for vengeance that she comes across as a force of nature who can’t be stopped. Her own team try to reason with her and fail because she is so far beyond reason at this point. Once again this makes Vince’s death meaningful and allows Juliana Harkavy to deliver a raw emotional performance. The attacks on criminals are brutally uncompromising and she is clearly fixated on her goal of finding Evil Laurel. 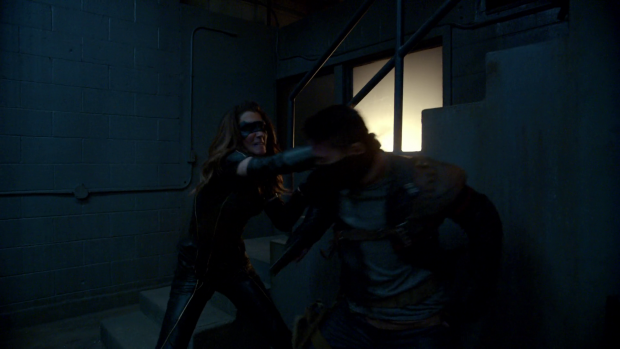 Once she finds Evil Laurel the action sequence that follows is impressively choreographed with Dinah’s movements clearly showing that she isn’t holding back. There’s no mistaking that she intends to kill Evil Laurel here and if she wasn’t stopped by Oliver she probably would have. Once Evil Laurel is captured and needed for bargaining purposes she accepts that the bigger picture is more important than her vengeance but only for the moment. Dinah is very much like a coiled spring throughout these scenes and makes it clear that if Cayden James doesn’t kill Evil Laurel then she will. This conflict has yet to be resolved as Evil Laurel is still alive at the end of the episode and Dinah hasn’t found anther way to resolve her anger over what she did. The rest of her team are concerned that they won’t be able to keep her in line so there’s an unstable element within the framework of the show at this point that makes things really interesting. Dinah is skilled enough to create a problem for both teams and her vendetta allows Evil Laurel have multiple purposes within the story. When it comes to the binary team dynamic this show could be doing a lot better. All we’ve had so far is the promise of two teams with the reality of them actually working together in every episode so far before Rene reminds them that nothing has changed. The number of times he has said this is laughable and it’s past time for the show to actually do something interesting with the split team. 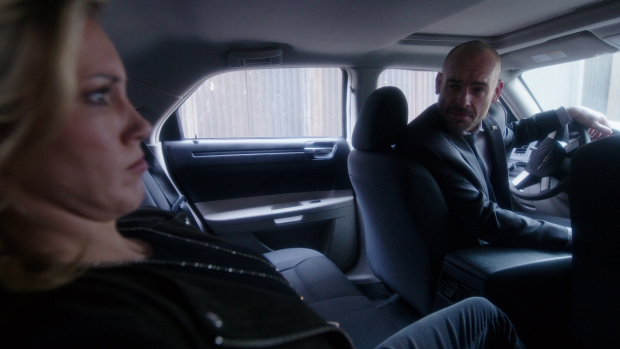 I’m hopeful that it won’t be obvious to them that Ricardo Diaz is running the criminal element of Star City which will put the two teams on different missions rather than having to come together to combat a larger threat that needs all of them every week. There’s no point in splitting the teams if we don’t actually see them working independently of one another. Quentin is still convinced that the possibility of redemption exists for Evil Laurel and is adamant that he’s going to be the one to make her change. His idealistic attitude to this has been really well done in previous episode and appeared to be a positive development for both characters but this episode takes it in another direction and suggests that it’s a really creepy thing for Quentin to do. When considering the situation as it exists there is something really concerning about it. Quentin is trying to force a woman who looks and sounds like his daughter to effectively become his daughter. She may share some traits with her but is fundamentally a different person. Recent episodes have been leaning on those similarities to tease a redemptive arc for her but what if the tease is a red herring? It’d be interesting if the conclusion to this was that she has very little in common with her deceased counterpart and Quentin’s obsession with turning her into what he wants her to be is leading him towards disappointment. The scene where he had her restrained in the back of his car as she lay there bleeding fully leaned into the creep factor by showing it from her perspective. Everything from the first person view of her waking up to the crazed way Quentin acted was perfectly played and offered a unique look at the situation that made us sympathise with Evil Lawyer and be worried about Quentin. Remove the familiarity and this scene looks like any innocent person being kidnapped might look. It’s a fascinating angle to take and I’m hopeful that the show will continue down this route because flawed characters are interesting character and seeing Quentin snap after all of the grief he has endured is a logical way for this character to go albeit a dark and morbid one. There was no organic place to mention this in the above review but I have to make reference to the Flash cameo. 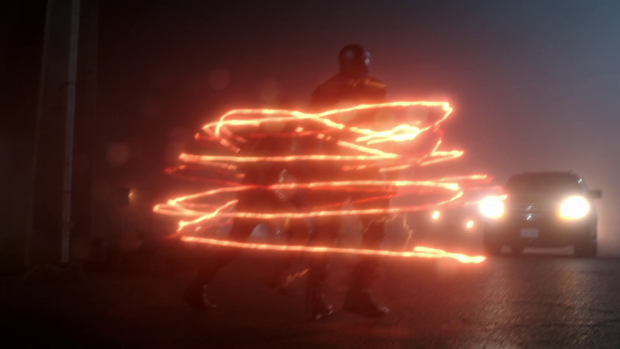 Grant Gustin doesn’t actually appear as Barry Allen but a visual effect suggesting his presence does. A similar thing was done last season to move the plot forward in a particular way. It’s a fun reference to the other show and helps keep in mind that this universe is a shared one where the characters do casually interact. It does beg the question why Oliver doesn’t do this more often and there are counter arguments such as only feeling the need when failure means widespread destruction. We all know he hasn’t called Barry in during other such instances but if he does that every time then Oliver Queen loses all agency within his own show. I choose to see it as Oliver making an assessment of a given situation and deciding that calling in Barry might be the only way he has a chance to resolve it. The rest of the time he acknowledges that Barry has his own problems and makes do. A great episode that wrapped up the Cayden James arc in a really surprising way. Using flashbacks to flesh out his relationship with his son and add further depth to the character worked really well because they focused on developing the character rather than delivering the information. His threat on the city added a great deal of tension and urgency to the plot and the stand off in the theatre was wonderfully played. The reveal that Ricardo Diaz is the real villain was really well done but problematic in terms of the plot holes that come with it. 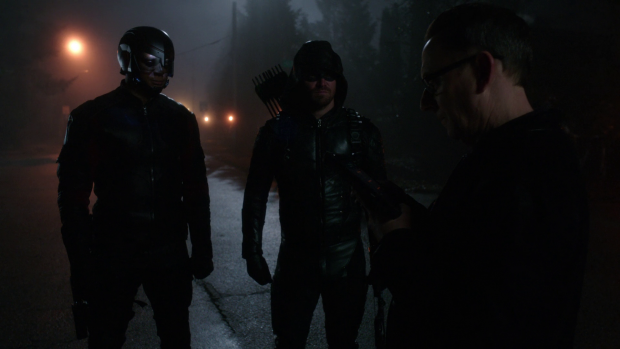 He is a unique threat to Team Arrow because he has no personal connection to them and working from the shadows should have some mileage to it. It’s very disappointing to lose Cayden James as there was a lot more this character could have done. Dinah’s vendetta against Evil Laurel is nicely handled as well. Juliana Harkavy does a great job playing a brutally vengeful Dinah and the fact that this isn’t resolved with her own team being concerned about her sets things up for further conflict nicely. The two teams do need to work independently of one another as the concept is being wasted by them coming together every week. Quentin’s obsession with bringing out his daughter in Evil Laurel crosses the line into creepy in a really big way this episode and it’s impressively done. I like the idea of Quentin descending into madness as he tries to look for something in her that just isn’t there.